Fundamentally exercise affects every system and function in your body by stimulating the circulatory systems that are critical to achieving longevity, good health and wellness. Although sunshine has many positive health benefits it is also the number one cause of skin cancer. “Move or Die” – This is what Jon Barron, the author of the best book ever written on complimentary health – “Lessons from the Miracle Doctors”, says about exercise. Why ? The two main circulatory systems are responsible for feeding every cell in your body with nutrients and for removing waste and toxins from the cells and inter cellular spaces and eliminating them from the body. This is the “miracle of life” cycle that decides our level of health and wellness and more specifically whether we will suffer from aches, pains, chronic disease or premature death. The Blood circulation system is responsible for pumping blood to every part of your body via the heart. The blood delivers oxygen and all of the necessary nutrients, immune fighters, and pH balancers, required by every one of the trillions of cells in your body to function optimally. The blood also removes the carbon dioxide waste from the cells. Exercise, not only improves the blood flow, but prevents high blood pressure and protects and strengthens the heart muscles to ensure it can pump healthy blood to all parts of the body. The Lymphatic circulation system, the waste removal system, often called the bodies sewerage system, is an extensive drainage network. It is twice the size of the blood circulatory system with twice as many lymph vessels as blood vessels and twice as much lymph fluid as blood. It helps keep bodily fluid levels in balance and is part of the immune system defending the body against infections. Unlike the heart, the Lymph system doesn’t have a pump but relies totally on muscle contractions caused primarily by exercise, movement and deep breathing to circulate the lymph through the body, every day, while eliminating the toxic waste that is the main cause of “acidosis” and most chronic diseases including cancer. So what exercise should we be doing ? Regardless of age we should all be doing an appropriate, balanced exercise regimen adapted to our individual needs. However your regimen should include aerobic exercise, strength training (weights) and stretching. Aerobic Exercise – aerobic means “requiring air” which means “oxygen”. As you know oxygen is our life line. Aerobic exercises, 10 to 30 minutes every second day, alternated with strength training, help you live longer and far more healthier. The easiest aerobic exercises which don’t require you to even go to the gym are walking, rebounding (bouncing on a mini trampoline), bicycling, swimming or other sports. Strength training – it is essential to alternate aerobic exercise with strength training. Two 45 minute weight sessions a week will improve overall strength, bone density, muscle mass, balance and physical activity, especially in older people. Obviously the older you are, the more important it is to customise your strength training programme. Although you can use machines at home we recommend that you work with a professional at your local gym to work out the right training programme for your needs. Remember most of us are not looking to become Mr Universe, but to keep our bodies healthy and disease free. Stretching – An essential part of both aerobics and strength training is to keep your body free from injuries. This is done by including a stretching programme that you should do every day as part of the warm up and cooling off for the aerobics or strength training. Yoga is a very good exercise as it stretches every part of your body and exercises your mind with the ability to relieve stress and depression. Assessment - Firstly you need to assess all aspects of your exercise activities and establish if they are meeting the needs to ensure that you have a balanced programme, including aerobic, strength training and stretching that will result in your body being in good shape, healthy and disease free. Based on your assessment, develop an exercise regimen that best suits your requirements, and your aspirations. If you find that for various reasons you don’t have an exercise programme and you don’ t get to the gym, we recommend that you look at investing in a “rebounder” or “bouncerciser”. 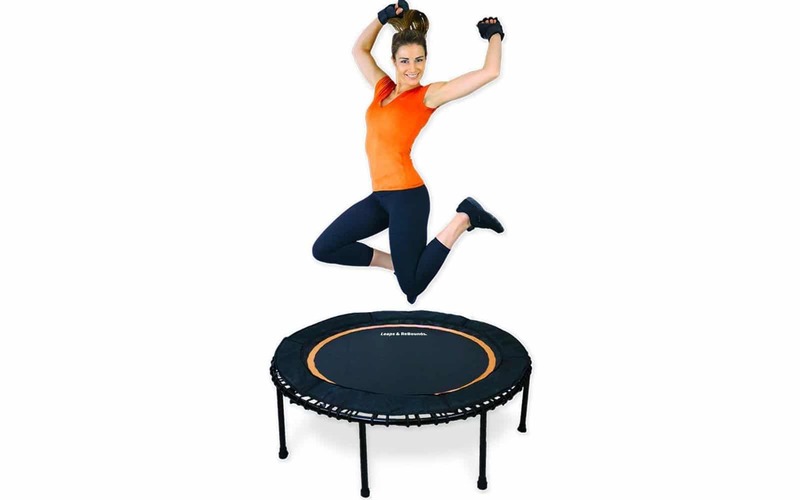 These are mini-trampolines either on their own or with an “overhead resistance system” that basically combines the benefits of aerobics, strength training and stretching into one training regimen that is fun and can be done at home. This is one of the very best ways to get both your blood and lymphatic circulation systems working at an optimum level, boost your immune system, strengthen your heart capacity, exercise all the muscles in your body and can be done by people of all ages. Next Lifestyle Choice - Prescription Drugs or Back to "Lifestyle Choices"